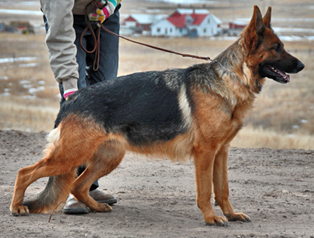 World class German shepherd breeder offering German shepherd puppies for sale in Colorado. 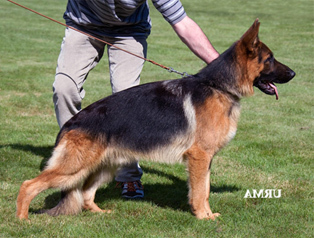 We breed the "west German" working show line German shepherd dogs to improve the world-class standards in quality, genetics, anatomy, conformation, disposition and health of our German shepherd puppy. At Gunbil German Shepherd we have the expert knowledge of the pedigree profile of our dogs, genetic research in temperament and psychological history profile, intensive health back ground information on key health issues, most of our German shepherd dogs are proven in all phases of "titling". At Gunbil German shepherds we know that the most important personality development begins when the puppy emerges from the warm and safe environment, in the mother’s womb. The interaction with the puppy socialization process begins here for us. We interact with the whelping in all stages of the birthing method, which includes the stimulation, cleaning and most importantly in handling the new born puppy. At this stage the puppy can feel our touch, the warmth it brings in assuring and bonding the human trust, most importantly the newborn puppy can understand our caring process, with love, joy and the human interaction. This is the foundation in our puppy socialization process. This is the very first development of Gunbil puppy imprinting, with this introduction and with every step we ensure that our puppies have strong and confident characters, love humans and are healthy from the start to live long healthful lives. We focus on many key points, but most importantly in the character behavior drive and character traits of the German shepherd dog must meet all phases of the sound temperament "CLEAR IN HEAD", Gunbil trademark. 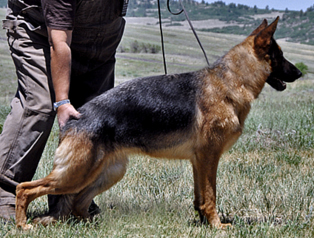 This is a proven factor in the genetics of the pedigree of the German shepherd. We're so confident in our world class Gunbil German shepherd breeding program that we can offer you a 5 (FIVE) year genetic health and temperament guarantee! Our five year guarantee is for your peace of mind, our commitment to you and your new puppy/dog. Our latest imported stud, Quento is Super pigmented, CORRECT , LARGE and POWERFUL STUD WITH masculine head and super size structure , BIG and strong young male with excellent "PLAY" and "PREY" drive. Quento is the grandson of 2007 "World Champion" Zamp vom Thermodos. The grand son of 2000 World Champion Ursus von Batu!!! His father is ranked #3 in the world in 2010 (V3 Gio vom Frankengold), fully titled with excellent hips and elbows. Quento BIG with excellent temperament, absolutely clear in the head (sound temperament). Ready to play and ready to please attitude. Ann, is super pigmented with sound temperament, clear in the head character, very nice pedigree coming from both parents. She is well balanced with an exceptional temperament, excellent with family and other dogs. Clear in head, balanced in nature family and show dog with excellent genetic-health. Her father is V4 Digger vom Elzmundungsraum, 4TH ranked in the world in 2010. Excellent litter for family with super piment of balck and red puppies! Puppies should be standard size with confident characters, beautiful and correct in type with excellent play drives. The puppies will inherit a SUPER nice genetic health and breed value from both parents. GREAT puppies for family with black and red pigment!!. Cassie, the sister from Cira, strong female, confident, courageous with correct type and good drive, very nicely pigmented, strong head, build in correct proportion, substantial, dry and firm, good movement with, safe in nature, secure temperament, absolutely clear in the head, excellent genetic health from both parents. Super nice litter for family, show with exceptional pigment. The puppies should be standard size with confident characters, beautiful and correct in type with excellent play drives. The puppies will inherit a very nice genetic health and breed value from both parents. GREAT puppies for family with black and red pigment!!. Georgia is super pigmented with an excellent pronounced mask, sound temperament, clear in the head character, world class pedigree coming from both parents. Georgia, is very friendly with excellent drive capability, well balanced, exceptional temperament, superb with family and other dogs. Clear in head, balanced in nature family and show dog with excellent genetic-health. She loves to play and she adores her family, very nice natural protection to protect her family from unsafe situations. The son of Tor Di Casa Nobili - A super world-class Italian stud. the grandson of VA7 Marko della Valcuvia, Robby - is very friendly and loves to play and please, he is powerful, strong and correct in type and in nature. A strong and healthy dog with happy, I-want-to-play character, loves his family with ready to please and ready to play attitude in any arena, world-wide, guaranteed. He could be goofy but and silly but ready to protect if needed. 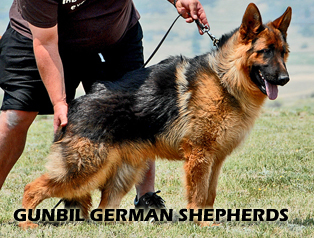 We are proud to introduce this young stud - into our world famous, Gunbil German shepherd breeding program. 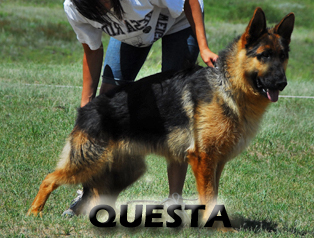 Questa is the granddaughter of 2007 "World Champion" Zamp vom Thermodos. The grand daughter of 2000 World Champion Ursus von Batu!!! 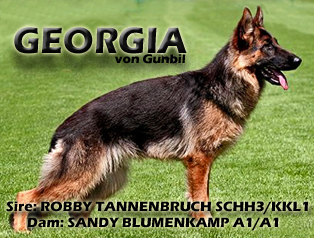 Her father is ranked #3 in the world in 2010 (V3 Gio vom Frankengold), fully titled with excellent hips and elbows. Questa has very healthy lines, absolutely clear in the head (sound temperament). She is absolutely a perfect family dog with strong desire to work, ready to play and ready to please attitude. This is a gorgeous female, anatomically correct and gorgeous. A exceptional litter for family and the show ring, the puppies should be normal size with very nice pigment (black and red) confident characters, beautiful and correct in type with excellent play drives. The puppies will inherit a very nice genetic health and breed value from both parents. GREAT puppies for family.